Winemaker’s Notes: Each of the varietals in the blend offers up their unique flavors to combine a refreshing and crisp wine with “high resolution” of flavors. The Grenache supplies the crisp mineral flavors with a hint of citrus in the lingering finish. My Review: Ah summer, when the rose’ flows (let’s be honest, it flows in the other seasons too). 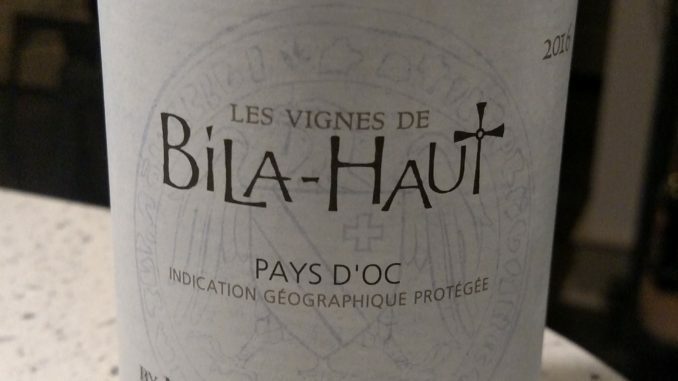 I’ve tried Bila-Haut wines in the past and generally enjoyed them, so I was happy to try out their rose’. A lighter pink in color, I picked up aromas of roses, while in the mouth the wine was crisp and refreshing, with flavors of dry watermelon that pair great with a hot summer day in the south, and the grilled chicken I paired the wine with. I drink a lot of rose’ this time of year, and at $15, this one is definitely worth looping into the rotation – it’s a great value, has good flavors, and would be great for sharing with friends by the pool. It may not blow your socks off, but it also won’t disappoint.